The 2003 Honda Civic Hybrid gave some competition to the Honda Insight while being much more user friendly for real world driving. 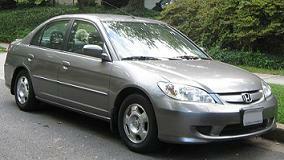 The 2003 Hybrid has its own distinctive look but it is no doubt related closely to original Civic platform. The subtle exterior distinctions, such as a unique front fascia, trunk lip spoiler, differentiating aluminum wheels, Hybrid badging and roof top antenna shows off the cars own personality. The interior also shares many attributes with the more base Civics. Some subtle differences are the battery cooling device behind the rear seat in front of the rear window and of course the all important insturment cluster sporting advertisments about the 2003 Honda Civic Hybrid fuel conservation. Driveability is also all Civic with the exception of starting and gear changes. The 2003 Civic Hybrid is equipped with a CVT or Continuously Variable Transmission . In every day speak this means that the vehicle does not shift through gears but works by matching engine speed with vehicle speed. As you pull away from a standstill the engine speed (revs) reach 3-5000 RPMs and as the vehicle accelerates the RPMs decrease. Also before even feeling the odditiy that is CVT you have to become used to the fact that the vehicle does not crank over to start and also shuts off when reaching a standstill. Aside from the cleverness surrounding these quirky attributes the vehicle handles with nimble agility, accelerates with vigor and gets you substantial fuel economy all while giving you the basic feel and usability of the standard Civic models. The 2003 Civic Hybrid powerplant is a partnership between a small 1.3 liter i-DSI (intelligent dual and sequential ignition lean-burn technology) four cylinder engine producing 85 hp paired with a battery pack and electric motor which is what makes it a hybrid. What this all equates to is the engine uses a less-than-optimal fuel/air blend, but burns that lesser amount of fuel much more thoroughly; dual spark plugs in each cylinder with their spark timing set slightly apart, help with that task.